I’ve been teaching for well over 10 years and have a studio in Hereford where I can teach/ coach from the absolute beginner to the advanced student. I’ll get you playing along to your favourite track in no time at all. I teach all styles and have had student passes in many grades. My style of teaching makes the lesson fun and informative. Pearl drums, Sabian cymbals, Pearl hardware including double pedal. I've played and toured as a working drummer for over 30 years. I've taught for well over 10 years on a 1 to 1 basis and in group situations. 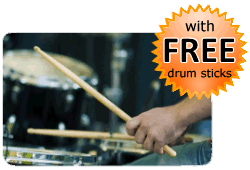 * PAY NOTHING NOW * Payments for drum lessons are made directly to Ian Warren. TRAVEL EXPENSES: If you choose for the Tutor to travel to the Student's location, the Student agrees to pay the Tutor's travel expenses. Estimated £10. You do not pay in advance to book a drum lesson with Ian Warren via this website. The Booking Request Form on this page enables Ian Warren to get in contact with you to confirm a day and time for the drum lesson.